What are your goals for the new school year? Think of two large, general goals and three small, specific goals. Tell me what those goals are improtant to you and what you will do to achieve them. 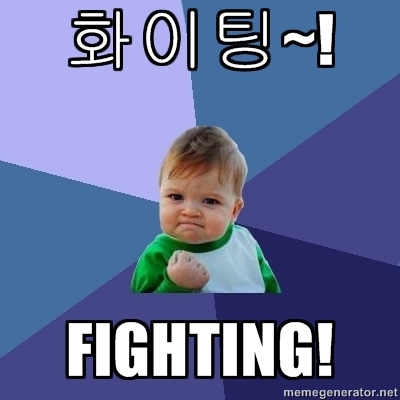 “Fighting!” is a common expression of encouragement in Korea. I’ve been doing the New York Times’ Scientific Seven Minute Workout for a few months now, and I’m noticing more results than I ever did just by running for an hour every two or three days, but with a few caveats—I work out for at least an hour, not for seven minutes; I record the time I spend doing these exercises, adding fifteen seconds to each whenever I do them; I eat whatever the hell I want (like a singularity, I can consume an entire pizza in less than a second); I walk or bike everywhere I go, and only get inside cars on weekends. I started this workout with a lot more dedication than usual because of its simplicity: I don’t have to waste my time or money going to a gym, I don’t have to embarrass myself in front of everyone sweating like a pig, flushed like a pig, outside, and all I need is a floor and a chair. Who Is The Best Stylist? Shakespeare writes as if the English language itself is writing: His tears run down his beard like winter’s drops from eaves of reeds. Tolstoy writes with the voice of the earth. I was first really hooked by the beginning of Sevastopol Stories, actually. Borges, in Spanish or English, is like bathing in a sunset. If you have ever felt, upon reading some comment or review that complains about too much description in a given book, or too many difficult words, a feeling of disgust—if you have ever suppressed an urge to roll your eyes when someone you know wonders about the point of fiction, or dismisses entire genres out of hand—then you must stop reading this blog post right now and go devour The Temptation of St. Anthony. Thought-sparking piece about anarchy in The New Yorker today: the anarchists involved didn’t convince me, or the author, however, that anarchism is any different from Savonarolism: take everything and burn it just because a few things don’t work. But it did get me to consider anarchy for an instant. I thought of the case of certain religious types, probably predominantly American, who believe that faith in god (and a corresponding fear of hell) is the only thing that keeps everyone from murdering each other, and there would seem to be a parallel among archists like myself: the government is the only thing that keeps murderers from breaking down my door. Allegorical tales that involve animal characters have notable appeal for adults as well. Orwell’s “Animal Farm,” for example, is a masterpiece of political commentary that is arresting in its simplicity. From the comments section of A Child’s Wild Kingdom. As soon as I read it I thought—simple? Orwell is simple? I don’t know, doesn’t Orwell seem, actually, to be kind of brilliantly complex? And doesn’t he just mask that complexicity in an attractively plain style? It looks like the people who wrote this movie are fully aware of the trouble with Superman: nothing can stop a god, since a god is, obviously, immortal, perfect, and, yeah, unstoppable. That’s the Platonic view which probably got Socrates in trouble with the Athenians—who executed him on a cross of hemlock!—dying for a love of knowledge rather than our sins!—but to go even further, and to look at God from the perspective of Islam, and Ali Farka Toure, God Is Unique; there is nothing like God, nothing can be compared to It; It cannot have arms, legs, thoughts, feelings, or any recognizable features. This philosophical view naturally eliminates any possibility of drama, since if God Is Unique, and everywhere and everywhen and nowhere and nowhen, then It’s also doing everything and nothing, and there’s no plot, no tension, no payoff. There are people who take fright. But I am of the opinion, Lachmann, that one should know no fear in this world . . . Love, it is said, is strong as death. But you may confidently reverse the saying: Death is as gentle as love, Lachmann. I tell you that death has been maligned. That is the worst imposture in the world. –Death is the mildest form of life: the masterpiece of the Eternal Love…[His eye falls upon the death-mask of Beethoven. He takes it down and, contemplating it, continues:] Where shall we land? Whither are we driven? Why do we cry our cries of joy into the immense incertitude — we mites abandoned in the infinite? As though we knew whither we are tending! Thus you cried too! And did you know — even you? There is nothing in it of mortal feasts! Nor is it the heaven of the parsons! It is not this and it is not that. What…[he stretches out his hands to heaven]…what will it be in the end?